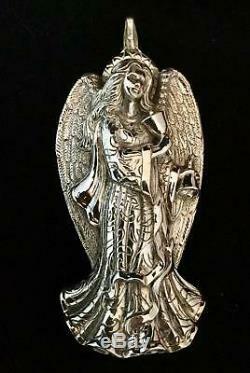 2012 Reed & Barton Sterling Silver Christmas Lydia Angel Bells Ornament & Pouch. A beautiful ornament without monograms! Please check out our other listings and follow us! 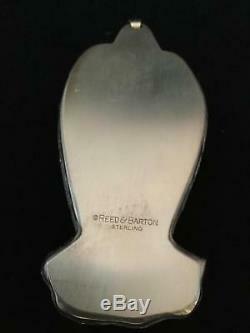 Please check our store - We have hundreds of Sterling ornaments from Gorham, Reed and Barton, Towle, Lunt, Metropolitan Museum of Art, and other manufacturers, vintage and new. Our inventory changes almost daily and we often have items not yet listed. Please "Follow" us for newsletters and deals, as well as our constantly growing and changing inventory. We also accept wish lists... We'll find your item for you if you just let us know, along with your price request. No obligation - if you don't need it when we find it, we'll find someone that has the same great tastes as you! Please let us know if you have any questions or concerns - We are always happy to help, and answer questions in 24 hours, including weekends whenever possible! It doesn't get any better than that! 16 years of perfect service! 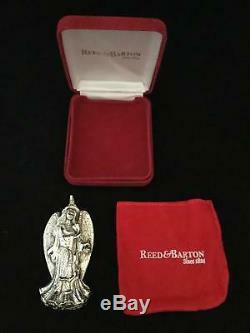 The item "2012 Reed & Barton Sterling Silver Christmas Lydia Angel Bells Ornament & Pouch" is in sale since Monday, November 26, 2018. This item is in the category "Home & Garden\Holiday & Seasonal Décor\Christmas & Winter\Ornaments". The seller is "libertyhilltexas" and is located in Liberty Hill, Texas. This item can be shipped to United States, Canada, United Kingdom, Denmark, Romania, Slovakia, Bulgaria, Czech republic, Finland, Hungary, Latvia, Lithuania, Malta, Estonia, Australia, Greece, Portugal, Cyprus, Slovenia, Japan, China, Sweden, South Korea, Indonesia, Taiwan, Thailand, Belgium, France, Hong Kong, Ireland, Netherlands, Poland, Spain, Italy, Germany, Austria, Bahamas, Israel, Mexico, New Zealand, Philippines, Singapore, Switzerland, Norway, Saudi arabia, Ukraine, United arab emirates, Qatar, Kuwait, Bahrain, Croatia, Malaysia, Chile, Colombia, Costa rica, Dominican republic, Panama, Trinidad and tobago, Guatemala, El salvador, Honduras, Jamaica, Antigua and barbuda, Aruba, Belize, Dominica, Grenada, Saint kitts and nevis, Saint lucia, Montserrat, Turks and caicos islands, Barbados, Bangladesh, Bermuda, Brunei darussalam, Bolivia, Egypt, French guiana, Guernsey, Gibraltar, Guadeloupe, Iceland, Jersey, Jordan, Cambodia, Cayman islands, Liechtenstein, Sri lanka, Luxembourg, Monaco, Macao, Martinique, Maldives, Nicaragua, Oman, Pakistan, Paraguay, Reunion, Uruguay.